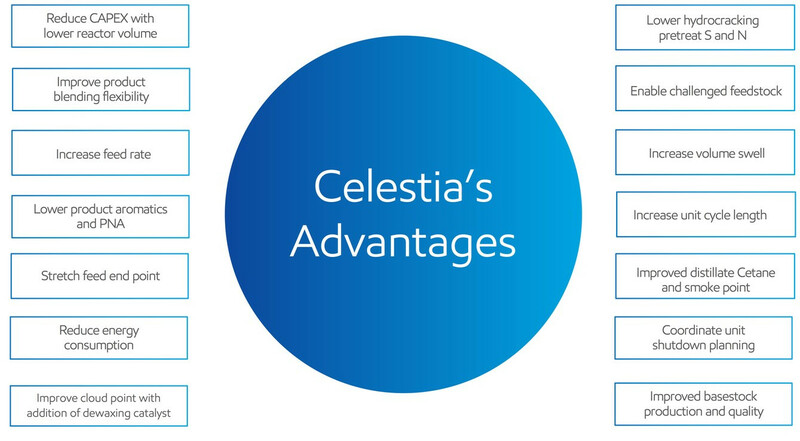 Celestia™ is a new hydroprocessing catalyst for refinery leaders focused on margin improvement. Celestia offers the highest HDS, HDN and aromatic saturation activity of any hydroprocessing catalyst in the industry. Celestia is jointly developed by ExxonMobil and Albemarle, like its predecessor Nebula®. Deployed alongside Nebula, Celestia allows operational flexibility, superior earnings, refinery optimization, and adds value beyond the hydrotreating battery limits. Carefully designed load of Celestia, was deployed in stacked configurations with Nebula. The combination lead to step-out improvement in performance over current supported catalysts. Celestia offers an ultra-high HDS / HDN / HDA catalyst activity that can allows a light feed hydrocracker to meet multiple performance targets. Increased HDS / HDN performance in the pretreat reactor can allow the process to operate in de-conversion mode by reducing the cracking reactor severity, leading to increased diesel / jet yield and improved product Cetane. Improved Cetane will change how the refinery can blend low Cetane molecules into the diesel pool and could enable a higher diesel volume output from the refinery. Adding Celestia to a reactor can offer the same benefit as having an extra reactor, or save on CAPEX required to add an extra reactor. Over the last three years ExxonMobil and Albemarle have deployed Celestia alongside Nebula at multiple sites around the world.